The Panda mission is all about sustainability, which starts with the materials we use. Bamboo is kind to the environment, as it leaves a much smaller ecological footprint than comparable materials. It is renewable and versatile, and boasts impressive strength and durability. Not only do Panda’s bamboo products offer superior style, but they're also better for the environment at both the beginning and end of their lifecycle. Bamboo is one of the most sustainable and diverse natural resources on the planet. With over one thousand varieties, it can be found growing on every continent except Antarctica! Bamboos are the only species of grass able to diversify into a full forest ecosystem. The larger species, such as the Mosu bamboo used to make Panda’s products, can be so large they’re often treated as timber. The smaller bamboo are typically cultivated as ornamental plants and found in an array of colors and sizes. Not only does bamboo grow everywhere, in all sizes, but it also grows fast. Really fast. Bamboo holds the current Guinness Book of World Records for fastest growing plant, with some varieties growing up to 91 cm (35 inches) a day. It's possible to hear the creaks and groans during sprouting season, if you have time to sit and listen to the grass grow. Bamboo is remarkably low impact. 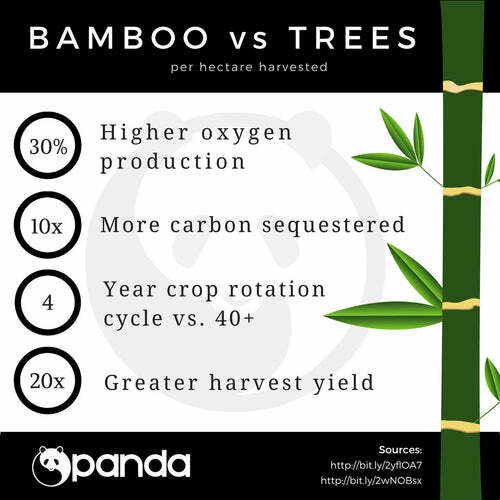 A bamboo farm has a smaller ecological footprint and produces 30% more oxygen than a tree farm of the same size. Each time the bamboo is harvested, the root system continues to grow and expand underground, producing new sprouts over a larger area and preventing soil erosion. The quick rate of reproduction means the same area can be harvested frequently without damage to the region. Due to its resiliency, bamboo was one of the first plants to grow back in Hiroshima after the atomic bomb. 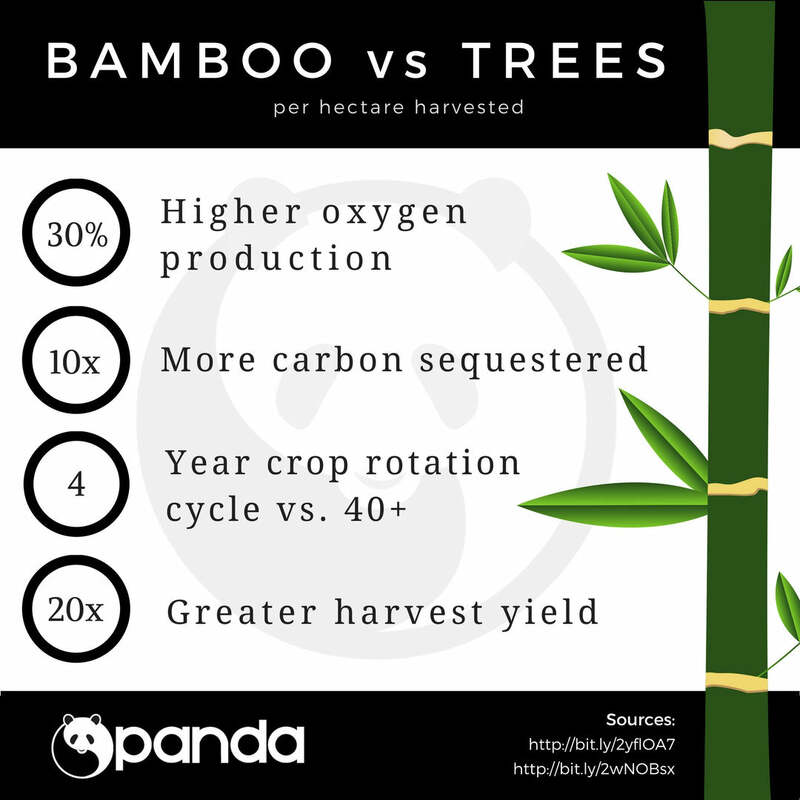 Species today thrive everywhere from sea level up to 12,000 ft., which means bamboo can be grown even in areas that have few options for viable commercial agriculture. These robust farms require less input of chemical pesticides and fertilizers while still yielding prolific crops, which is good for the environment and the local farmers. Crafting Pandas out of Mosu bamboo is a great idea, but it’s hardly a new one. Bamboo has a long history in the construction, trade, cuisine, and art of many cultures around the world. We took a good thing one step further, and the results have been rewarding. Bamboo is lighter by volume than most softwood lumber - the original line of Pandas are light enough to float! Don’t mistake its lightness for weakness; bamboo has a tensile strength greater than steel and can withstand compression better than concrete. These qualities make it an ideal construction material, both in traditional building and in modern architecture all over the world. Its strength comes from its flexibility. Bamboo shoots reach their full mature height during their first growing season, and only add additional upper branches during following years. The capacity to bend rather than break is what gives bamboo products such a dynamic advantage. We’re not the only ones who think so. Bamboo is having a renaissance in the manufacturing world, and its strength as a raw material is only the beginning. It can be woven into cloth or turned into filament for 3D printing. It is surprisingly durable; when compared to hemp-fiber rope, which loses strength when it gets wet, bamboo fibers actually get stronger. Carbonized bamboo fibers can even conduct electrical current. The possibilities are endless, and we can’t wait to keep exploring! Header image based on Bamboo 2 by Pedro Fernandes, which is licensed under CC BY 2.0.